On June 21, 2014, a team of astronomers submitted a preprint which revealed their detection of a super-Earth around CD-49 13515 (or Gl 832). Designated "c" after a previously discovered Jupiter-class planet b in a cold outer orbit, planet c has about 5.4 +/- 1.0 Earth-masses, an orbital period of 35.68 +/- 0.03 days at a semi-major axis of 0.163 +/- 0.006 AU, an orbital eccentricity of e= 0.18 +/- 0.13, and an orbital distance near the inner edge of its host star's habitable zone. 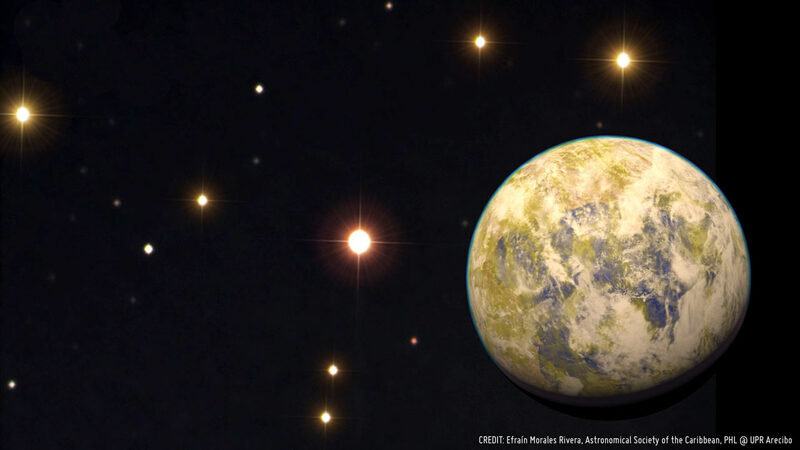 If it has an Earth-like terrestrial atmosphere, planet c may have Earth-like temperatures with possibly with large seasonal shifts, given a similar terrestrial atmosphere, but a denser atmosphere as would be expected for massive super-Earths could easily make the planet too hot for life and more akin to a super-Venus instead (Sci-News.com, June 29, 2014; Astronomy Picture of the Day; and Wittenmyer et al, 2014). This star is located about 16.1 +/- 0.1 light-years (ly) away from our Sun, Sol (Bailey et al, 2008). It can be found in the southwest corner (21:33:34.0-49:00:32.4, ICRS 2000.0) of Constellation Grus, the crane, at the border with Constellation Indus, the Indian -- southwest of The Persian (Alpha Indi) and Arkab Prior and Posterior (Beta1,2 Sagittarii), northeast of Peacock (Alpha Pavonis), and southwest of Al Nair (Alpha Gruis) and Beta Gruis. Much dimmer and smaller than Sol, it is not visible to the unaided Human eye from Earth's surface. On September 8, 2008, a team of astronomers submitted a paper for publication on the discovery of a Jupiter-class planet in orbit around this dim star (Bailey et al, 2008 -- more below). Due to CD-49 13515's proximity to Sol and the discovery of at least on planet around this otherwise dim red dwarf, the system has been an object of high interest among astronomers. 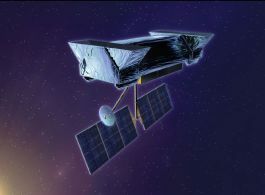 CD-49 13515 has been selected as a target star by NASA's optical Space Interferometry Mission (SIM). The mission will attempt to detect planets as small as three Earth-masses within two AUs of each star. (Some summary system information may still be available from the SIM Teams), but the SIM project manager announced on November 8, 2010 that the mission was indefinitely postponed due to withdrawal of NASA funding. Although the star is now commonly referred by some astronomers as GJ 832 or Gliese (or Gl) 832, it was probably first catalogued as CD-49 13515 in a visual survey of southern stars begun in 1892 at the Astronomical Observatory of Cordoba in Argentina under the direction of its second director John M. Thome (1843-1908). Thome died before the completion of this southern sky atlas in 1914, when 578,802 stars from declination -22� to -90� were published as the Cordoba Durchmusterung ("Survey"). The "CD" is an extension of an older catalogue by Friedrich Wilhelm August Argelander (1799-1875) in 1863 on the position and brightness of 324,198 stars between +90� and -2� declination that were measured over 11 years from Bonn, Germany, made with his assistants Eduard Sch�nfeld (1828-1891) and Aldalbert Kr�ger (1832-1896), which became famous as the Bonner Durchmusterung ("Bonn Survey") abbreviated as BD. The BD and CD were greatly expanded and extended into the modern age of photographic surveys with the subsequent creation of the Cape Photographic Durchmusterung from South Africa. CD-49 13515 is a red dwarf star of spectral and luminosity type M1.5-3.0 V. This star has been estimated to have around 45 +/- 0.05 percent of Sol's mass (Bailey et al, 2008), 43 to 48 percent of its diameter (NASA Star and Exoplanet Database, as derived from the power law formula of Kenneth R. Lang, 1980; and Pasinetti-Fracassini et al, 2001; and Johnson and Wright, 1983, page 699), and about 0.7 percent of its visual luminosity and 2.8 percent of its bolometric luminosity (NASA Star and Exoplanet Database, as derived from the exponential formula of Kenneth R. Lang, 1980). It is chromospherically quiescent and appears to have only around 49 percent of Sol's abundance of iron relative to hydrogen (Bonfils et al, 2005a). Useful star catalogue numbers for CD-49 13515 include: Gl 832, Hip 106440, HD 204961, CP(D)-49 11439, LHS 3685, LTT 8573, LFT 1640, LPM 787, L 354-89, Sm 83, and 2MASS J21333397-4900323. In order to be warmed sufficiently have liquid water at the surface, an Earth-type rocky planet would have to be located very close to such a red dwarf star as cool and dim as CD-49 13515 , even accounting for infrared heating. According to the discoverers of planet c, the conservative habitable zone for a planet of five Earth-masses lies between 0.130 and 0.237 AU (Wittenmyer et al, 2014; and Kopparapu et al, 2014). This would be well within the orbital distance of Mercury in the Solar System. At planet c's 0.16-AU distance from its host star, it may develop a tidally locked, synchronous orbit around its host star. 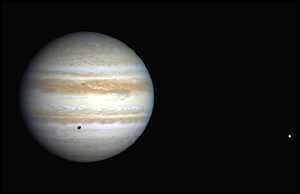 On September 8, 2008, a team of astronomers (Jeremy Bailey, R. Paul Butler, G.C. Tinney, Hugh R.A. Jones, Simon O'Toole, Brad D. Carter, and Geoffrey W. Marcy) submitted a paper for publication on the discovery of a Jupiter-class planet in orbit around this dim star (Bailey et al, 2008). 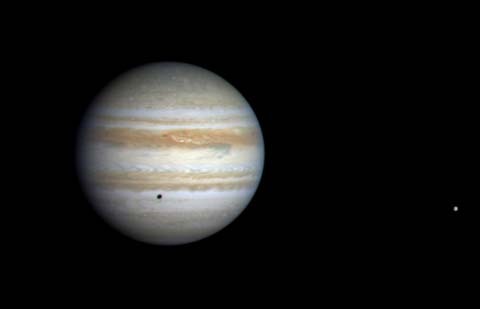 The planetary companion has at least 64 percent (+/- 0.06) of Jupiter's mass (or 203 Earth-masses). Moving around CD-49 13515 at an average distance (semi-major axis) of 3.4 +/- 0.4 AUs, planet b's orbit is completed within 9.4 years (3,416 +/- 131 days), with an eccentricity (e= 0.12 +/- 0.11) within the Main Asteroid Belt in the Solar System. The following star systems are located within 10 light-years of CD-49 13515. Grus, the Crane, is a small constellation of the Southern Hemisphere. Lying just below Piscis Austrinus (the Southern Fish), Grus was at one time part of that constellation. Grus was named by Johann Bayer and first listed in his 1603 star atlas, Uranometria. For more information about the stars and objects in this constellation and an illustration, go to Christine Kronberg's Grus. For an illustration, see David Haworth's Grus. Constellation Indus was created by Dutch navigators Pieter Dirkszoon Keyser and Frederick de Houtman, who charted the southern skies from 1595 to 1597. Since many Europeans were exploring North America at the time, Johann Bayer decided to honor the new constellation by naming it for the American Indian in a collection of new constellations for his 1603 book Uranometria. For more information about the stars and other objects in this constellation, go to Christine Kronberg's Indus. For an illustration, see David Haworth's Indus. © 2008-2014 Sol Company. All Rights Reserved.